The ruling Zanu PF party has accused opposition leader Nelson Chamisa of trying to intimidate Constitutional Court judges ahead of Wednesday's historic election challenge hearing. The apex court will hear Chamisa's challenge against the results of the crunch July 30 presidential elections in which he polled 44.3 percent against President Emmerson Mnangagwa's 50.8 percent. Chamisa's party alleges rigging and "gross mathematical errors" by the Zimbabwe Electoral Commission (ZEC) and seeks to be declared the winner or, alternatively a fresh election. On Monday the MDC Alliance leader called a press conference where he said after following the legal route in challenging the poll result, his party would pursue a "political one" to ensure "the vote is protected". Responding, the ruling Zanu PF party said opposition leader, a lawyer, was trying to intimidate thee court ahead of the hearing. 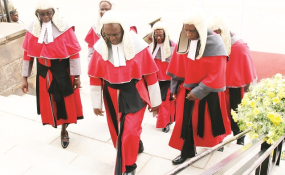 "It defies legal sense why a person who is an officer of the court seeks to make extra-judicial pronouncements while still making court submissions at the same time, and ahead of due process only two days away," said Patrick Chinamasa, Zanu PF's secretary for finance. "(Chamisa's) statement, which is completely bereft of any legal grounding or basis, builds on many such well documented utterances and threats which he made throughout the campaign period, including declaring himself the inevitable winner well ahead of the polls, and well before vote counting and the announcement of results; threatening spiralling violence should the vote go against him and, threatening to spoil matters for the eventual electoral winner." Chinamasa said the opposition leader was using public violence and intimidation of the Bench to make up for "a bad case". "Indeed, this leaves right-thinking people wondering why (Chamisa) has submitted himself to court processes in which he lacks confidence and, what is more, when he disrespectfully seeks to be at once a complainant and a judge in his own case," he said. "Confident litigants respect court processes and avoid running shrill propaganda campaigns against both the Bench and their opponents. "Such unlawful conduct further fortifies our long-held view that what Chamisa and his Alliance partners are looking for is not justice, but a subversion and reversal of the verdict which the people of Zimbabwe expressed through the ballot box on 30 July, 2018."